We love riding bikes here at FLi... all types of bikes! But all too often there is something that gets in the way, be it work, snow, the sofa or a host of other excuses / reasons that we all regularly roll out. So if we're finding reasons not to ride, we're not setting a very good example are we! 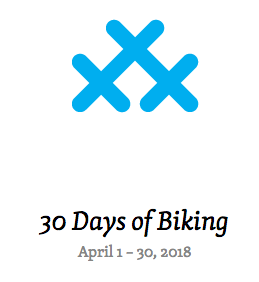 April see's the 30 Days of Biking challenge roll out again, and this year we're going to attempt it, and encourange all our dealers to also promote it. More people on bikes is good for everyone, so lets make it happen in April this year. We will be promoting it across all our social media platforms and getting some of our staff and team riders to blog about it. There’s no minimum distance — down a hill and around your garage count just like a 20-mile commute or a 350-mile charity ride. If you miss a day, no worries. Just keep riding and don’t give up! It’s all for giggles, or as serious as you want it to be. What matters is that we’re all in this together. And yep, spin class counts! Follow updates and join the community on Twitter, Facebook and Instagram. Make new friends on our Joyful Riders Worldwide Facebook group. The team at 30 Days of Biking are fundraising for World Bicycle Relief, with an aim to raise $30,000. Make the pledge, and share your joy of riding with students in rural Africa! To learn more and start your fundraiser, visit: http://30daysofbiking2018.worldbicyclerelief.org.